A media storm erupted last week after a press conference was held by the PSNI about the murder of Kevin McGuigan. Kevin McGuigan was shot dead after media speculation had linked him to the killing of Jock Davison last May in the Markets area. At the press conference Det Supt Kevin Geddes for the PSNI said that; “Action Against Drugs as you may be aware made a public statement on 6 August that they would execute anybody who had any involvement or they believed had any involvement in the murder of Jock Davison”. He went on to say that it was his assessment that; “Action Against Drugs are a group of individuals who are criminals, violent dissident republicans and former members of the Provisional IRA...They are dangerous, they are involved in violence and extortion of the nationalist and republican communities and they have a criminal agenda...My assessment is that this is a separate group from the Provisional IRA”. 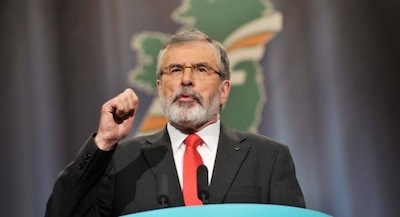 However, it was his subsequent comment that a “major line of inquiry for this investigation is that members of the Provisional IRA were involved in this murder” and that he could not say at this stage “whether that was sanctioned at a command level or not and I’m not prepared to speculate on that” that was seized upon and created the subsequent political and media furore. Some unionist politicians, ever quick to rush to judgement against Sinn Fein, threatened to exclude our party from the Assembly and Executive. Elements of the media were no less quick. Some main media outlets speculated that ‘Action Against Drugs’ had entered into a working arrangement or joint enterprise with the IRA. Action Against Drugs has been vigorously opposed by Sinn Fein and accused of murder and extortion by Gerry Kelly and other republican leaders. Journalists, some with long experience who should have known better, speculated that republicans were working with a criminal gang - riddled with agents and informers - made up of people trenchantly opposed to the Sinn Fein peace strategy and leadership. The inconsistency and contradictions inherent in this position were ignored. During the years of conflict and censorship the idea of balance or of proper journalistic investigation, with some notable exceptions, went out the window. But in these more peaceful times the lack of impartiality and objectivity in this instance is equally striking. A press conference which was supposed to be about a murder investigation, morphed seamlessly into a media and political storm as to the status of the IRA. As unionist leaders blustered, threatened and condemned Sinn Fein and the political institutions looked increasingly fragile the PSNI Chief Constable held another press conference. “Our assessment indicates that a primary focus of the Provisional IRA is now promoting a peaceful, political Republican agenda. “It is our assessment that the Provisional IRA is committed to following a political path and is no longer engaged in terrorism. “I accept the bona fides of the Sinn Fein leadership regarding their rejection of violence and pursuit of the peace process and I accept their assurance that they want to support police in bringing those responsible to justice. He went on to further describe Action against Drugs as “an independent group that is not part of, or a cover name for the Provisional IRA”. Unionist politicians ignored the bits that didn’t fit with their narrative and jumped on Hamilton’s claim that the IRA still exists to ratchet up the crisis. I don’t agree with the PSNI Chief Constable’s claim that the IRA exists - even in the benign way he paints it. The war is over and the IRA is gone and is not coming back. Over the two or more decades of the peace process Sinn Fein and republicans, including the IRA, have taken a series of historic initiatives to create the opportunity for peace; to sustain the process in difficult times and to overcome obstacles. The progress that has been made is the collective work of many parties, groups, and individuals. But without the active participation of republicans and the risks we have taken for peace there would be no peace process. Time and again elements of the British and Irish governments or the unionist parties and others have connived to undermine the political institutions. Some have done this in a very premeditated way while for others, crises have been created through their failure to fulfil their obligations or to uphold the Good Friday and other agreements. The Sinn Fein leadership has worked hard to find imaginative and innovative ways to resolve problems. But this problem is not of our making. Sinn Fein has no responsibility whatsoever for those who killed Kevin McGuigan or Jock Davison. The response of the other political parties to these killings has been self-serving and short sighted. The political institutions are already in considerable difficulty. There are important elements which have not been implemented. There are major budgetary difficulties and an ongoing effort by London to impose austerity policies on the northern Assembly. There is also the ongoing and unanswered questions about the sell-off of NAMA’s loan book in the north and the allegation that some politicians and associates have benefited from this. Interestingly, though this goes to the heart of the Irish government, as well as the Executive, there is no speculation of the kind which is now in full flow around Sinn Fein’s worthiness as a political party. Let me be very clear. Once again. Anyone who breaks the law should be held accountable by the justice and policing agencies. Sinn Fein supports these agencies and we will co-operate with the PSNI in their investigations into the killings of Jock Davison and Kevin McGuigan. We have consistently called on anyone with information to bring that forward so that those responsible can face due process in the courts. We are very mindful of the fact that there are two families and local communities grieving for the loss of loved ones. It is our firm view that anyone involved in illegal activity should be held accountable before proper judicial processes. The PSNI investigation should go where the evidence takes it. It should be afforded all possible support to this end by all of the political parties and the two governments. Let me be equally clear. Enough is enough. Sinn Fein has no special, or particular or specific responsibility to respond to the allegations made about the IRA, above and beyond what I have outlined here. There is no basis for the charges made against Sinn Fein by our political opponents and if this descends into a political crisis it is a direct result of their stupidity and party political opportunism. Indeed given the manner in which the debate has descended into personalised attack, invective and Sinn Fein baiting, it is hard to know how the other parties, Executive Ministers or Irish government Ministers would hope to sort this crisis out. Unless of course, and I accuse them of this, they are motivated entirely by party political and electoral interests. Sinn Fein will not allow ourselves or more importantly our electorate to be demonised or marginalised over matters that have nothing to do with us. In this case there is nothing more Sinn Fein can do. We have done more than anyone else to bring an end to conflict in our country and to open up an alternative peaceful and democratic path for republicans to pursue republican objectives. This never existed before. The opportunistic and deeply cynical way in which these events have been seized upon to attack Sinn Fein, our integrity and our electoral mandate and the democratic rights and entitlements of our electorate, is shameful and will be robustly resisted by our party and our leadership. British efforts and unionist posturing in this respect are not surprising. Every and any opportunity and issue is grasped by the unionist leaderships to try and dilute the potential of the Good Friday Agreement and the institutions. But the intervention of Fianna Fail leader Michael Martin, and Minister for Justice Frances Fitzgerald and others in Dublin is especially contemptible. Frances Fitzgerald has uncharacteristically undermined her role as Minister for Justice to politically smear Sinn Fein. Micheal Martin has also sought to use these killings for party political purposes. He was the Minister for Foreign Affairs when the then Minister for Justice, Dermott Ahern said that the IRA was gone and not coming back. In 2010 when Sinn Fein successfully negotiated the transfer of policing and justice with the two governments he was part of process. He never raised the matter with me once. But now we are on the cusp of an election and Micheal Martin is in electioneering mode. His outrageous claim that the IRA funds and provides political intelligence for Sinn Fein while exercising community control is despicable. Last year the people of Ireland in free votes in the European and local government elections gave Sinn Fein the largest vote of any party on this island. Where those votes coerced? Are those voters naive or stupid or intimidated? No. They voted for Sinn Fein because we provide a real alternative to the bad politics of Fianna Fail, Fine Gael and Labour. And that is what really worries these parties. For our part Sinn Fein will not be distracted from continuing with the difficult work of building the peace, resolving the budget issues in the Executive, getting on with the business of making the institutions function properly and winning support across this island for Irish unity and for the Republican alternative to austerity. We will also continue to support the PSNI and An Garda Siochana in their fulfilment of their duties and we will make ourselves accountable to the electorate in the upcoming Assembly election and in the general election when the Taoiseach has the courage to call it.